June 27, 2014: Daily Life. Click photo to be redirected to the full article. June 30, 6.40AM, 2014: ABC774. Radio Interview with Libbi Gorr on the Red Symonds Show. Click play to listen. July 11, 2014: Lip Magazine. Click photo to be redirected to the full article. July 11, 2014. Tune In Not Out Guest Blog. Click the image above to be redirected to the full article. August 1, 2014, Discordia Zine. Click the image above to to be redirected to the full guest post. 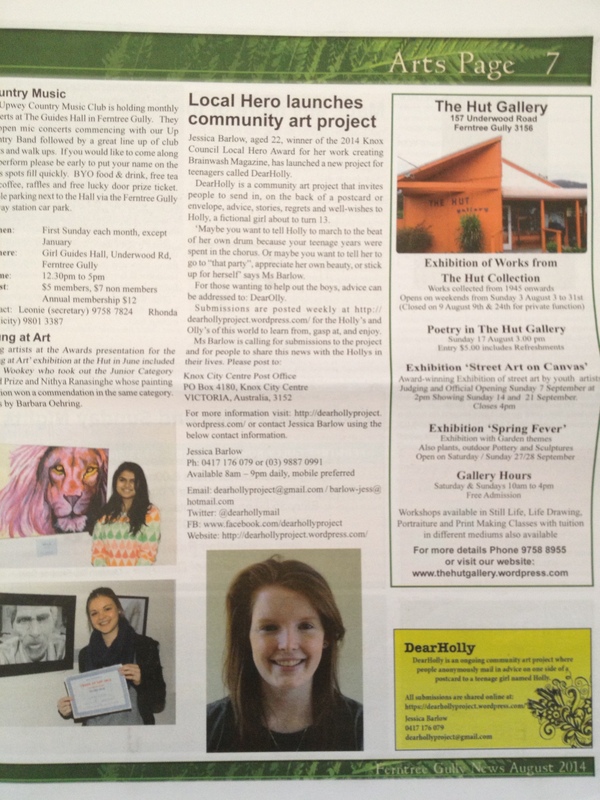 August 9, 2014, Ferntree Gully News August Edition. Click photo to be redirected to the full article. August 17, 2014, The Weekly Review, Booroondarah Edition. 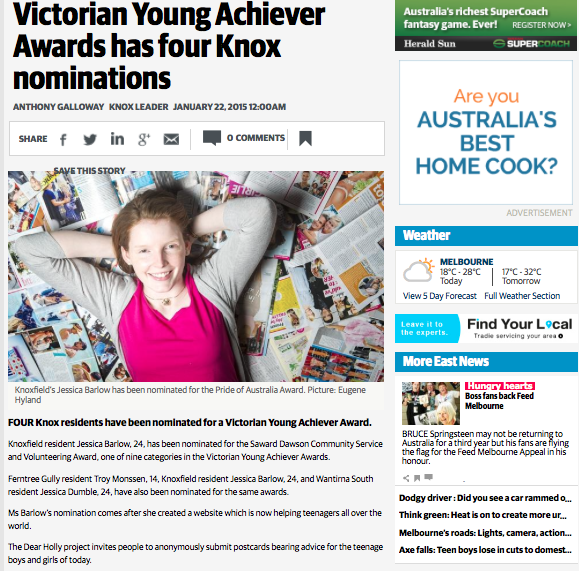 Click photos to be redirected to a PDF or click here to read the online version. August 20, 2014, Aphra Magazine. Click photo to be redirected to the full article. 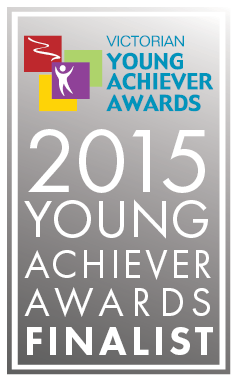 August 31, 2014, Unleashed Festival by The Foundation for Young Australians, Made in Vic Award Winner Video. September 3, 2014, The City Journal, Click photo to be redirected to the full article. September 16, 2014, Knox Leader, Click article to zoom in. October 4, 2014, Herald Sun. Focus is on Brainwash Project however was nominated for the award for DearHolly work also. Click photo to be redirected to the full article. October 30th, 2014, The Project tenplay.com.au. 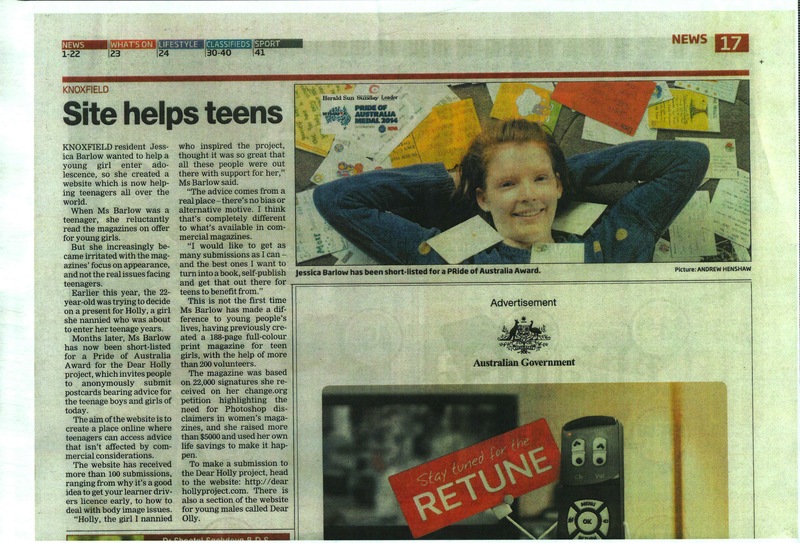 Article about the Brainwash Project & DearHolly Project. Click image to be redirected to full article. October 30th, 2014, The Project Daily Show 6.30mpm AEST. To view the entire segment, click here. January 20, 2015, Knox Leader. To read the article in entirety, click here. 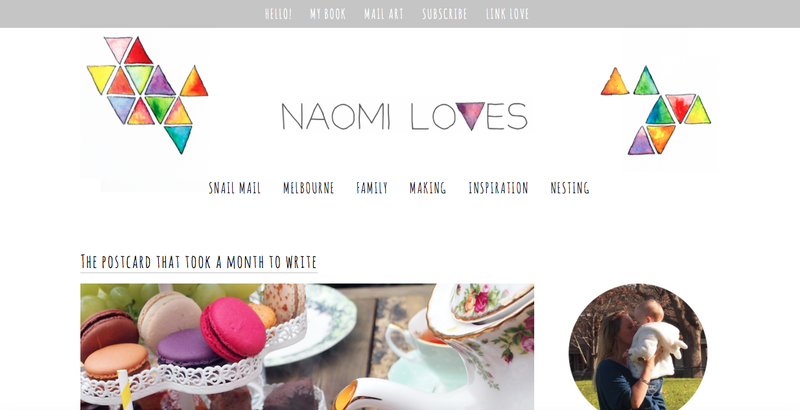 February 19, 2015, Naomi Loves Blog. To read the full article, click here.